Total Immersion | American University Washington D.C.
American University President Neil Kerwin and President's Award winner Tatiana Laing. Incoming American University freshmen are encouraged to make the most of their time here. Yet you won’t find many students who have been as immersed in campus life as Tatiana Laing. Whether it’s student activities, social justice campaigns, community organizing, challenging courses—or all of the above—Laing has had the complete AU experience. Through it all, Laing nailed the most important part, earning almost all A’s in her classes. As the culmination of all of her hard work, Laing is this year’s winner of the President’s Award. It’s the highest honor for undergraduate students, recognizing an individual whose accomplishments are truly exceptional. When hearing about Laing’s dizzying array of activities, you might ask: When do you sleep? Actually, Laing tries to get at least seven hours of sleep a night, and she partly attributes her success to staying sharp and alert. In addition, she’s always thinking about what comes next. Laing, an Honors student, is graduating from the School of Public Affairs with a BA in interdisciplinary studies: communication, legal institutions, economics, and government (CLEG). A daughter of Jamaican immigrants, Laing grew up in Piscataway, New Jersey. Laing’s father is a doctor and a pastor, and she says her family’s religious values helped shape her social conscience. During her high school years, she filled her spare time with volunteer service and organizing food and clothing drives. During her first year at AU, Laing got involved with Caribbean Circle. With rich musical traditions and great food, it’s been a home away from home for her ever since. But it also facilitated a network to so many other organizations on campus. She’s been a student coordinator of Alternative Breaks, training other social justice leaders and helping to introduce a program in Baltimore. As an Alternative Breaks participant in Chicago, she learned about youth and poverty, and her time as a leader in San Francisco included a trip to San Quentin prison. As an assistant for the Summer Transition Enrichment Program (STEP), she helped first-generation college students get acclimated to life at AU. Even now, as a graduating senior, she’s encouraged to see so many of those same faces thriving on campus. “I feel very closely connected with those students, and it really does make me proud when I see that they’re starting organizations here at AU,” Laing says. She has also been a receptionist and office assistant in the Office of the Vice President of Campus Life. “We’ll celebrate her graduation, but we’ll miss her calm and capable presence at our front desk,” says Vice President of Campus Life Gail Hanson. Laing attended AU during a critical time in this nation’s history. The police-related deaths of Michael Brown, Eric Garner, Freddie Gray, and others led to nationwide protests and the growth of the Black Lives Matter movement. In this atmosphere, racial tensions spilled over onto college campuses across the nation, including AU. Through her work with The Darkening group, Laing became a leading voice for refuting bigotry and creating a more inclusive campus climate. She’s led a number of training sessions for fellow students, faculty and staff. “We provide a very basic workshop that just teaches people what structural racism actually is. It sounds very simple, but it’s not,” she says. 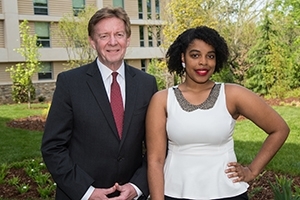 Her scholarly interest, and the subject of her capstone, is African-American women in the criminal justice system. Through one of her mentors, SPA professor Robert Johnson, she’s been a fellow and consulting editor with the AU-run BleakHouse Publishing, which sheds light on the experiences of incarcerated individuals. Following graduation Laing will be a fellow with Change Corps, a group that trains community organizers. She’s also taking the LSAT this June, and her eventual goal is to work as a criminal defense lawyer. “Because of the way that our system disproportionately affects people of color, to this day, it’s still the first line of defense for my community,” she says. As she’s set to graduate, Laing is not only pondering her future, but also reflecting on her time here. “I think AU has made me who I am today,” she says. Yet as people who know her point out, she’s left an indelible mark on the university.